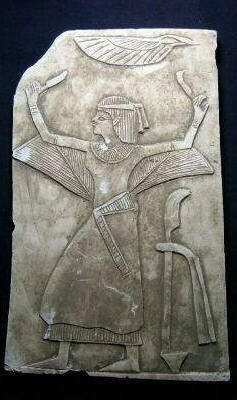 The above listed item is from the New Kingdom Period,(1539-1075 B.C.E.). This "Isis Relief" is carved from stone. 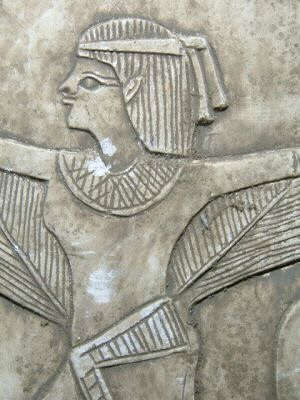 She is depicted in a kneeling position with wings extended froward. She is eclipsed with lotus lillies, there are two partial cartouches and several hieroglyphics. This rare fragment of a larger panel is intact and has age wear. The reason for the item being available is due to the vast extent of archeological findings, thousands of years in Egyptian burials and also the proliferation of these said items in older private collections worldwide. The timeline on our items is a suggestive guideline for the listed Egyptian Period.